That’s one of the questions I get asked the most. The answer is yes. I get lost all the time. It’s rarely a problem and besides – getting lost is part of the fun. There are a bunch of different ways to navigate on the road. They include: paper maps, GPS, offline maps on a smart phone, a compass and optimism. I use all the above depending on the situation. Paper maps are great. In an ideal world I’d always have a good map in my handlebar bag cover. They are the easiest way to visualise the ‘big picture’ of what’s going on around you and they are also wonderful ice-breakers. Everyone loves maps. If someone asks me for advice on a direction to cycle it’s far easier for me to point it out on a map. If I want to ask a local which route they’d recommend they can easily draw it out for me. They’re also just great for showing to people – many folk around the world won’t have seen a map of their area. 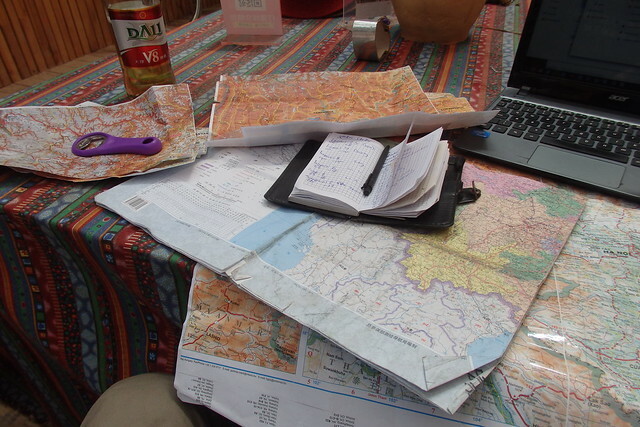 Bring a map to a dinner party in some corners of our planet and you’ll be a very popular man. I’m serious. There are problems with paper maps. Firstly, they are expensive. Good quality Western-made maps are not cheap. Once you’ve added them all together you’ll have spent the same money as you could have on a cheap phone with inbuilt GPS (more on that below). In many countries the local made maps are useless – the best ones are in fact foreign made. I’m a cheapskate. If I meet someone with a good map I often borrow it and photocopy the sections for my handlebar bag. Sometimes I buy the local ones (when they are cheap) and draw the English-names for places on them if they’re in non-roman letters. If you’re in a place with tourist offices always pop into them to see if they have a regional map. Often they are free and perfectly adequate. Paper maps don’t tell you where you actually are. That is why I use offline maps on my phone for my primary navigation needs. There is a good chance you already have a smart phone. Most of them have a GPS built in which locates you’re position without mobile data. You get hold of an offline map application and then download the offline areas (when you have WiFi) for where you are heading. When you’re wondering where you are, you simply open the app and it will tell you precisely where you are in the world. If you are cycling in a country where you already have mobile data you can just use a normal online map (eg. Apple Maps & Google Maps). You still may want to consider an offline map app if you are travelling somewhere where you might not get phone signal. I use two apps: Maps.me & Mapout. Both these apps use Open Street Maps (OSM) which is a free and editable map of the world. There are a bunch of GPS apps that do the same thing but Maps.me is my preferred one (and is also the most popular among cyclists I meet). Most importantly – it’s completely free. It has routing options making it easy to work out how far away something is. It also gives directions, so you can clip your phone onto to your handlebar and follow it’s directions. You can easily add bookmarks to it which is very useful for planning and is great for sharing locations with others. In mountainous regions I use Mapout as well as Maps.me. Mapout is great because it downloads the contour information for offline use – allowing you to see the terrain around you. The best thing about Mapout is how you can load a route onto it and view the altitude profile. You create a route on a mapping website (eg. Ride With GPS more on that in this tab [not yet made!]) and save the .gpx file. Transfer the file to your phone via email and open it up in the app. Not only does it show you the altitude profile of your chosen route, it also shows you exactly where you are on it. So when you’re crawling up that big mountain that never seems to end, you can check how many miles away that elusive pass is. 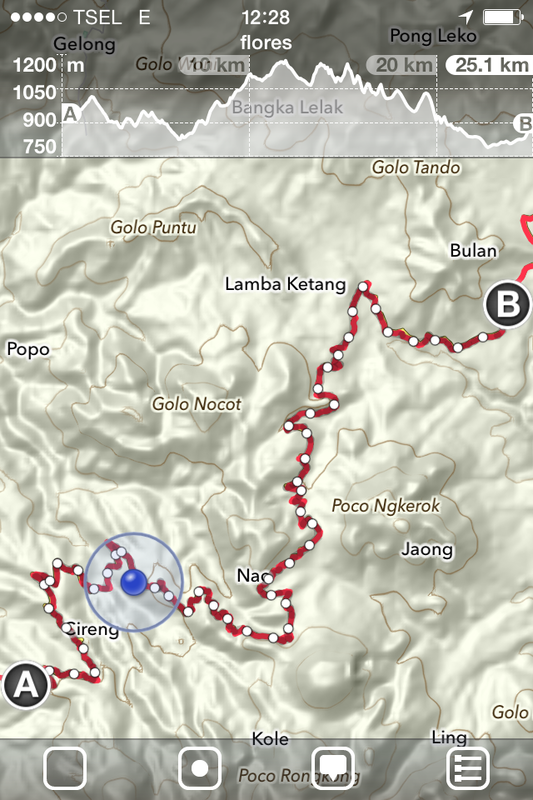 For mountain roads like this Mapout is a very useful tool! In the picture the GPS hadn’t quite located me yet, if it had there would be another blue dot on the top graph. OSM has its limitations. In some countries it’s thorough. In others it leaves a lot to be desired. Usually the detail is enough but sometimes (if I have mobile data) I use Google Maps for more information. You can also download areas of Google Maps for offline use but I’ve found that they occupy too much data with too much detail. OSM was useless in China when I was there. 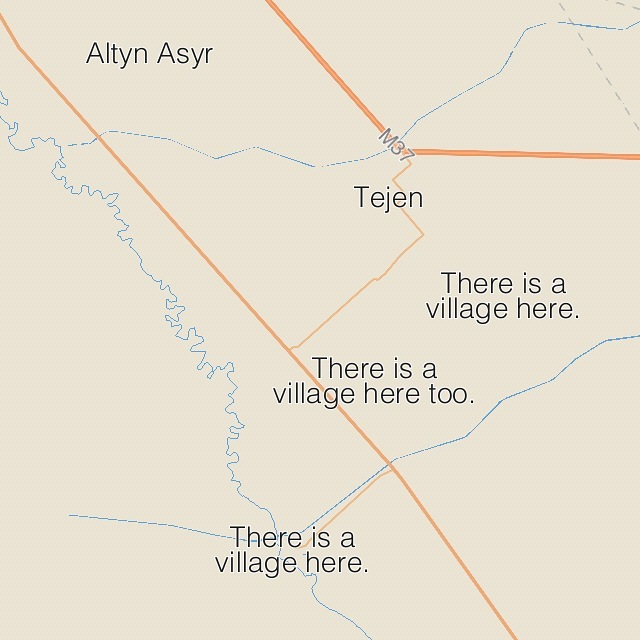 Some of the new purpose-built towns only had a couple of roads on OSM when I was there. Sometimes the new roads between cities weren’t even marked yet. Google is blocked so you need a VPN installed to use that platform. The best app for China was Baidu. You can download areas offline but it’s a bit fiddly if you can’t read Mandarin! If the paper maps are not enough but you don’t want to use a smart phone then you could take a GPS and attach it to your handlebar. Personally I don’t think they are worthwhile with a phone at hand but I do sort-of have a GPS. I say sort-of because my GPS (a Garmin Edge 200) doesn’t actually show maps (and also sort-of because it is a useless bit of electronics). I can create a .gpx route (I explained how I do that in this tab [again – to be typed!]) 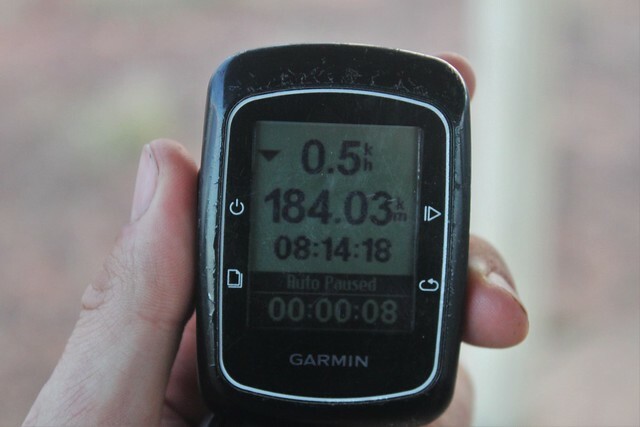 and view just the line on my Garmin. It shows me where I am on the line, or how far I am from it. It’s like following a breadcrumb trail. I wouldn’t recommend it as a practical way of navigating but for some purposes it’s very useful: For example, let’s say I’m cycling from one address to another. I know where I am starting the day and where I’m ending it. I have to find my way out of one city and then navigate into another one 50 miles away. It would be so frustrating to keep checking my phone at every suburban road crossing so I make and transfer a .kml or .gpx file onto my Garmin (a 5 minute job). Then I have a neat line to follow out of town and into my address in the afternoon. Because there is no map on the little screen it is not distracting and saves me a lot of time trying to find a specific address (my least favourite thing!). Never underestimate a compass. I always have one hanging around my neck. If you follow a bearing you will eventually get to the right place. For the first month I had no idea I could use my phone as a GPS. Instead I had a co-ordinate to end on and a patchy breadcrumb trail on my Garmin. I followed my compass, hoped for the best and I always made it to where I needed to be. It was Western Europe – there were always people around to ask, there were roads everywhere and there were no mountains to complicate things. Being completely lost might not have been so much fun in other parts of the world. Like everything with bike touring there is no right or wrong way to do things. I’ve met people who cycled all the way around the world with only paper maps. That’s how people had to do it a decade ago! I’ve met others who anally plan every inch and then record the data to upload onto Strava. It took me a long time to find out how I best like to navigate. Sometimes I plan a careful route so I know exactly how long it will take me to get from A to B. Other times I just get a paper map and ‘go with the flow’. My phone is half-broken and the GPS doesn’t really work anymore. Recently I didn’t have any signal for 10 days and my phone had no idea where I was. I didn’t have a paper map with me. But it didn’t matter – there was only one road and I had all the time in the world.